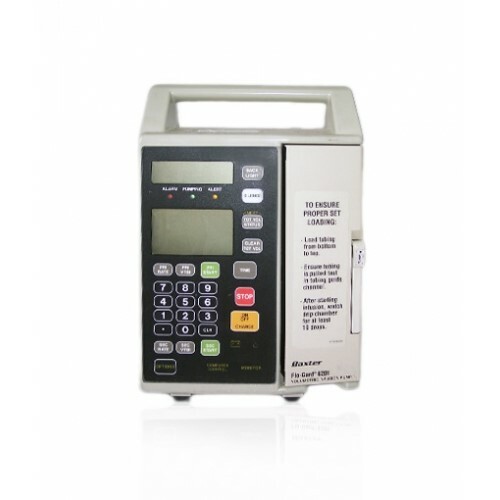 Buy or rent pre-owned, recertified Baxter Flo-Gard 6201 Single Channel Infusion Pumps you need today. All pre-owned medical equipment is patient ready equipment and is covered by an OEM matched warranty. Primary Program: 1.0-99.9 mL/hr in 0.1 mL increments or 1-1999 mL/hr in 1 mL increments. Upper limit can be reduced by authorized personnel Secondary program: 1.0-99.9 mL/hr in 0.1 mL increments or 1-999 mL/hr in 1 mL increments. 1.0-99.9 mL in 0.1 mL increments or 1-9999 mL in 1 mL increments for primary and secondary. Upper limit can be reduced by authorized service personnel.